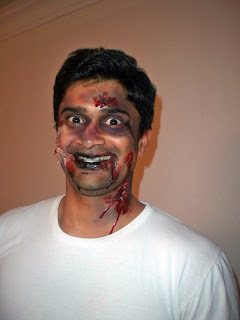 I also wanted to show you a client who came to get a zombie makeover as well. He was very helpful in suggesting areas for new wounds and skin decay, lol. Here he is, the smiling zombie! I went with "Mascara Melissa". 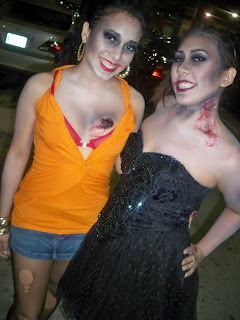 Even though we were zombies, I still wanted us to be semi-cute. I still gave us girly makeup...but went with really pale skin from our faces down to our chests, arms, and back. I also went in with heavy contouring in bruise-like colors. For the lips, I applied a bold color and just took my hand to wipe the mouth to give it a smeared look. I also gave each of us a distinct wound. "Mascara Melissa" had a bite wound to her boobie. I had a bite wound and strangulation hand mark to my neck. Here I am with the BF. I did a different kind of look on him by incorporating more greens and yellows to his skin. He bought his clothes from Goodwill...he wanted a 70's vibe to go with his "zomb-pimp" look. He added tears and fake blood to them too. I didn't really pull off the "zomb-hoe" look because I found this super cute looking prom/ballerina dress at Goodwill for $5! Instead, I imagined myself as a prom queen that got bitten by the "zomb-pimp". 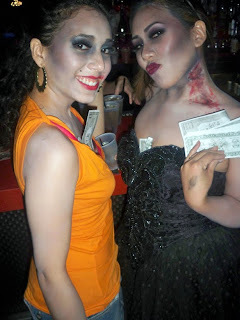 "Zomb-Hoes" and our dolla bills! Getting eating by the "zomb-pimp". Doesn't "Mascara Melissa" look like she really got a chunk eaten out of her boobie? I also applied some contouring to give her some more cleavage. That's a trick you can use anytime you go out. Stay tuned for my Cheetah Girl looks from Halloween night. 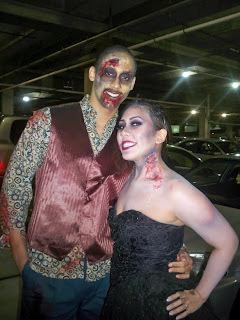 If you used any of my tutorials for your Halloween look, don't forget to send me pics so I can feature you on my blog! woo hoo urban pretty is up and running! it looks fab! 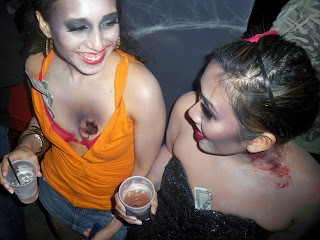 awesome costumes and halloween makeup!